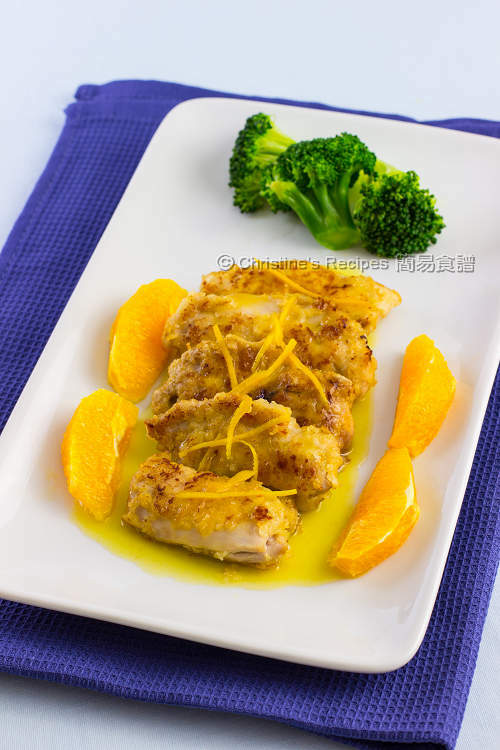 The tender and succulent pan-fried chicken thighs taste amazingly good in the fragrant orange sauce. It's best served with hot steamed rice or any favourite salad greens. The weather is getting colder. And oranges are in season right now. I particularly love Australian navel oranges. More and more sweet navels are available in the market and their prices are going down. Ever tried to make any dishes with oranges? If you get a chance to get some sweet oranges, give this recipe a go. 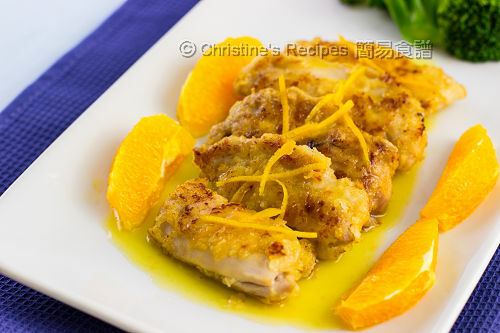 The whole orange can be used to make this delicious pan-fried chicken thigh dish. I used the juicy and sweet pulps to decorate making the dish look more appetizing. 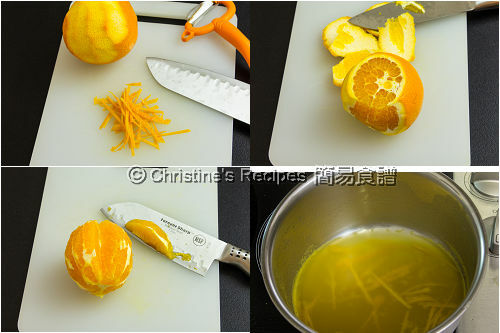 The orange zest enhances the fragrance of sauce, as a result that you don’t want to waste every bit of it. Pound and get the chicken thighs flat. Cut into smaller pieces. Mix with the marinade. Then coat with whisked egg and flour before pan-frying. To make orange segments: Cut the top and bottom of an orange. Trim away the skin. Remove any remaining white pith. Cut between the membranes and segment the flesh. Rinse chicken thigh. Wipe dry with kitchen papers. Use the back of a knife cleaver or meat tenderizer to pound the meat. Cut into 2 to 3 pieces. Mix with marinade well. Set aside for 15 minutes. Heat oil in a fry-pan. Dip chicken pieces in the whisked egg. Lightly coat with flour. Shake away the excess flour. 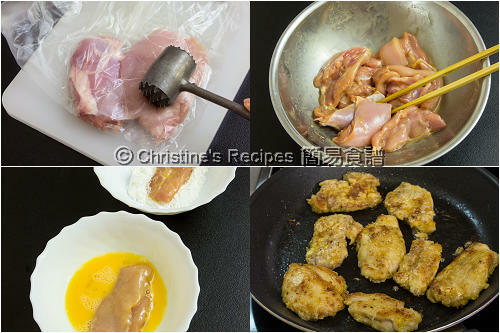 Pan-fry the chicken until both sides are golden brown and cooked through. Set aside. In the meantime, cook chicken stock and orange zest in a small saucepan over medium-high heat, until reduced by half. Pour in the sauce. Bring it to boil. Stir in the thickening and cook to your preferred consistency. Drizzle over the cooked chicken. Garnish with orange segments. Serve immediately. Chicken breast or thigh can be used to make this dish. The soul ingredient of the dish is orange juice. Make sure the orange you used is sweet. Try its taste before cooking. The amount of sugar and lemon juice can be adjusted according to personal preference. I just cooked up my version of Pan Fried Orange Chicken for my family last night. Our recipes are different - gonna save this for a taste later. Thanks for the share. Sweet, savoury and tangy...I love the combo of flavours. 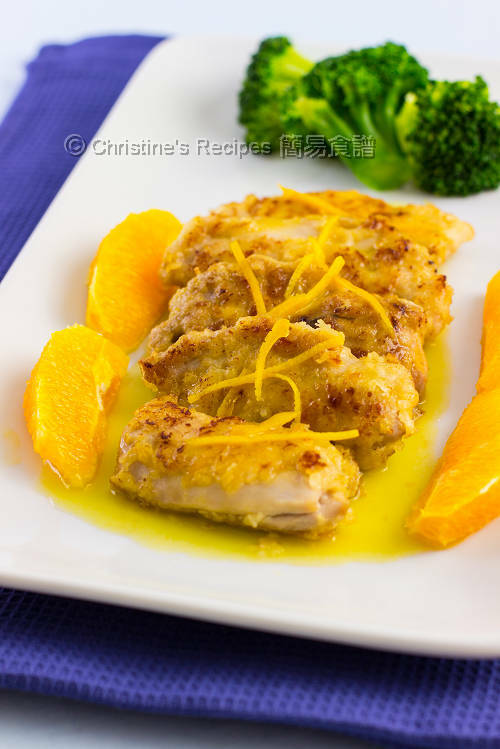 These chicken thighs look fingerlickingly delicious, Christine.